Google Keyword Tool is a window into the world’s innermost desires. 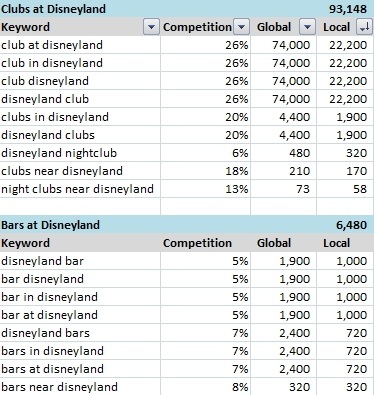 Often the keywords reported are mundane and predictable: [hotels at disney], [disneyland restaurants], etc. Some days, however, I’m struck by a particular phrase and the intent behind it. To the keyword phrases that brighten my days I dedicate this “As Seen on GKT” column. People go to Disneyland to have a good time. For some people having a good time is synonymous with partying, and for others it means photos of the kids with Snow White. These two search phrases show different sides of the “having a good time” coin, which is what fascinates me most. Bars: It’s hard to mistake the intent here. People looking for bars in or around Disneyland are either there to party, or there with the whole fam-damn-ily and in need of something to dull the edge. The [bars near disneyland] query caught my attention first and got me thinking about the parents who just wanted to wander off and drown out the shrieking scene with a stiff drink or five. But who am I to say. Last time I went to Disneyworld with my then-princess-obsessed daughter Hazel I had a glass of wine or two and quite enjoyed myself. But I didn’t feel the need to tie one on or search out the available bars nearby. There’s a difference and it puts a pretty big downer on the whole “Happiest Place on Earth” thing. Clubs: While bars have a more depressing connotation in my opinion, clubs have a celebratory connotation. You go to a club to dance and have fun, not to sit on a stool and stare into your cups. When I happened upon the search queries for [club at disneyland] and the like, I realized there’s another side to drinking at Disney — the fun side! I could especially recall all the 20-somethings I saw at Disneyworld and the great fun they were having. Of course they’d seek clubs as part of their trip. OK, that’s less depressing. Secret Club: But what’s this? A secret Disneyland club? 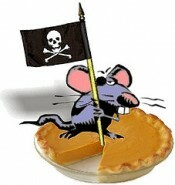 Keyword research exposes you to some of the coolest stuff you never knew existed. Like a secret members-only club in the New Orleans Square section of Disneyland. 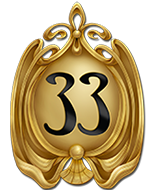 If you’ve got a couple extra grand lying around and love Disneyland, check out Club 33 for the elite experience. Apparently. 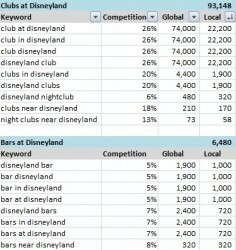 What I found interesting overall is that “club” keywords associated with “disneyland” outweigh “bar” keywords 14:1. Some of those “club” searchers may be looking for travel clubs, fan clubs or book clubs, but if that was the intent it’s more likely they’d search for the “disney” brand overall than the “disneyland” theme park. We’ll just agree that there may be some intent contamination in the “club” searcher data set, but even so it appears far more people want to find clubs than bars at Disneyland. Which frankly cheers me up more than it should, really. It’s rather life affirming to think that there are more celebratory intent searches than “I can’t bear my family vacation” searches. 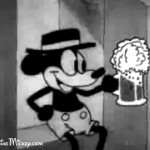 So let’s all have a drink to Mickey and the crew.